So in both my Learn to Program: The Fundamentals and my Introduction to Systematic Programming – Part One they introduce the concept of design recipes – basically a step by step way to write certain programming features, like functions for example. So I wanted a way to recall these recipes within the shell so in the beginning I can always follow the recipe when I’m designing, in this case, functions. Now the problem with my cheat is that I can’t call the function remotely, and have been using the (require module_name) that loads it right at the beginning and not as a callable function. So if anyone has any ideas on how to replicate what I’ve done in python in racket(BSL), I’m all ears! I was reminded by a friend about this site I told them about months ago, I think I remember seeing it in this TED talk by Mitch Resnick called Let’s Teach Kids to Code. The site was called CodeSpells. Essentially it’s a fun way to teach people how to code with a Fantasy type game environment. “The character wakes up in a strange place populated by gnome-like creatures. She has been sent here to learn the ways of magic. The gnomes are in need of her help, they know a little magic, but don’t have enough to accomplish simple tasks. They need her help, and she needs theirs. With some guidance from the gnomes, she takes her first faltering steps with magic. She begins to master her power bit by bit, while trying to prepare for a scary and dark future. Essentially master wizard in this case means master coder/programmer. So I did a little digging and found some more games that do the same (see related article below). 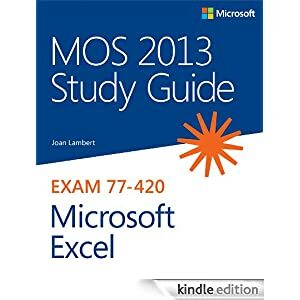 As the 2010 version of Excel, although currently a standard will eventually be replaced by the 2013 version, I’ve decided to change my focus from MOS: Microsoft Excel 2010 towards MOS: Microsoft Excel 2013. This will keep my skills using the latest generation of the Excel platform and keep the credential for longer as most organizations haven’t yet and probably won’t migrate for sometime to the 2013 versions. They’re millions of digits long, and it takes an army of mathematicians and machines to hunt them down — what’s not to love about monster primes? Adam Spencer, comedian and lifelong math geek, shares his passion for these odd numbers, and for the mysterious magic of math. Mathematics: If you had to teach yourself math from basic algebra to high level mathematics, what would be your strategy? It all depends what the questioner means by ‘want[ing] to become very good at math’. How do you define ‘very good’? And what sort of mathematics do you want to learn, and why? Let’s address the second question first. With any learning activity – and particularly with self-directed learning – it is important always to have the objective of that learning in mind, firstly so that you can plot an efficient course towards it (thereby hopefully avoiding wasting your time on unproductive detours and irrelevant distractions), and secondly so that you’ll know when you have reached it. The language’s potential usefulness to you personally, i.e. is it widely spoken, or required for your job, or do you plan to visit the country (or countries) where it is spoken? The language’s aesthetic qualities, i.e. is its spoken form particularly pleasing to the ear (e.g. many people like Italian because of its varying rhythm and expressive tonality), or its written form and alphabet especially pleasing to the eye (many people like languages with – to them – ‘exotic’ non-Latin alphabets such as Cyrillic, Arabic or Japanese)? The language’s level of difficulty, i.e. is it an easy language to learn, in terms of its pronunciation, written form and grammatical structure, or a difficult one that you might perhaps choose if you are looking for a challenge? Mathematics is a vast and constantly expanding discipline, with several major subject divisions (e.g. algebra, geometry, analysis, topology) and hundreds of subdivisions and specializations. Just as with languages, different branches of mathematics may have different degrees of usefulness to you, or different aesthetic qualities in terms of the beauty of their central ideas or their written form. And they will certainly present different levels of difficulty in terms of their grammar, vocabulary and conceptual abstraction. Do I know which areas of mathematics interest me? Do I even appreciate how many different areas of mathematics there are? Statistics (statistics is often taught as a discipline in its own right, rather than as part of a maths course). Generally, the more prestigious the university or college, the more advanced the material in its degree courses will be, so some (e.g. Ivy League (US) and Russell Group (UK) universities) will introduce topics at the undergraduate level that others (e.g. smaller ‘provincial’ universities) would only cover at the postgraduate/Masters level. If you want to use mathematics to solve practical problems, then your choice of mathematical subjects will depend on what sort of practical problems you are interested in. But all ‘practical’ mathematical problem solving will require certain basic skills, and familiarity with some of the more generic tools of mathematics, such as algebra, geometry, calculus, combinatorics, probability and statistics. Now that you have decided which areas of mathematics you want to study, you need to answer the first question I raised: Exactly how ‘good’ do you want to become as a mathematician? Once again, the language analogy is helpful: When you are learning a foreign language, you have to decide what level of proficiency would be sufficient for your needs. Do you want to be able to converse confidently and fluently with native speakers (difficult – for most people)? Do you just want to be able to understand books, music or films produced in that language (easier)? Or do you simply want to be able to use the language on vacation, to read road signs and restaurant menus, and to ask and answer simple questions in hotels, banks and shops (easiest)? The same sorts of questions apply to mathematical proficiency; do you want ‘conversational fluency’, or reasonable literacy when reading mathematical books, or just to be able to ‘get by’ and read the road signs? Well, only you can answer these questions, of course. Firstly, understand that you cannot read a mathematics book in the same way that you read a novel. Reading a mathematics book should be an active – and interactive – experience, not a passive one. You will be required to follow detailed arguments and – often complex and subtle – lines of reasoning, and to continually answer questions that the text poses to you. In particular, you will be required to check for yourself that you understand all the mathematical derivations, ideally by reproducing the calculations and confirming the results for yourself. You will therefore need a notepad in which to do your own calculations as you read the book. Also, if you are aiming – in the language analogy – for conversational fluency, then it is very important that you not only read the text but also do the exercises, because to achieve proficiency in mathematics, as in any other subject, there really is no substitute for practice, practice, practice! Finally, in learning mathematics, you should follow the pedagogical principle of ‘Learn it, play with it, own it!’: When you have learned a new piece of mathematics, take some time out from your reading to thoroughly familiarize yourself with it byplaying with it! Viewed in one way, mathematics is an absorbing intellectual game, and playing with it is not only great fun but also the best way to really learn it and understand it. By ‘playing’ with it, I mean thinking up problems or posing yourself questions that you suspect might be answerable using the mathematics you have just learned, and then applying that mathematics to try to solve them. Or perhaps you might try to generalize the mathematics you have just learned and apply it to a broader range of problems, or connect it with other mathematics with which you are already familiar. All of these activities will help to embed the new mathematics more deeply in your mind, so that you no longer have to refer to your notepad or textbook in order to recall it and use it, but can summon it up effortlessly; playing with mathematics will make it instinctive and second-nature to you, so that you can call on it at any time and, like an old and loyal friend, it will always be there for you. :o) When you have achieved this level of proficiency in a mathematical subject, then you can truly claim that you have attained the third stage of competence – i.e. that you own it (or, in the terminology of NLP, that you have achieved unconscious competence in it). And that should be ‘good enough’ for you, and for anyone else for that matter! My own disposition is the latter, partly because I find variety and novelty stimulating, and partly because my other interest, theoretical physics, requires familiarity with a broad range of mathematical disciplines. All theoretical physicists are mathematical generalists to this extent (and this is one of the reasons I was drawn to theoretical physics in the first place); we are probably familiar with more areas of mathematics than most professional mathematicians, although our knowledge of any particular area generally won’t be as deep as that of mathematicians who are experts in it. This is something I know a great deal about, as this is how I learned most of the mathematics I know; book-based study has always been my preferred way of learning the subject, even when I was at university. I generally regarded lectures as an inferior form of instruction to self-study, partly because of the inherent limitations of the ‘chalk-and-talk’ format (especially in a large lecture theatre), partly because of the poor quality of some of the lecturers (e.g. the mumblers you just couldn’t hear, the droners who sent you to sleep, and – perhaps worst – the reluctant and disinterested lecturers who you knew regarded lecturing as a tiresome duty that distracted them from their more interesting research work), and partly because their material was frequently so damned boring and irrelevant to my real interests (particularly in theoretical physics). My philosophy was that if I could find a good book on a subject, written by an acknowledged expert in it, then I shouldn’t need to attend any lectures in it, and attendance should therefore be optional (my lecturers took a different view, of course…).